It's day three of Robert Oster ink week, so today's ink is Robert Oster Australian Sky Blue. I purchased my samples of ink from Goulet Pens. I love using blues in January, so let's take a look at how the ink performs. 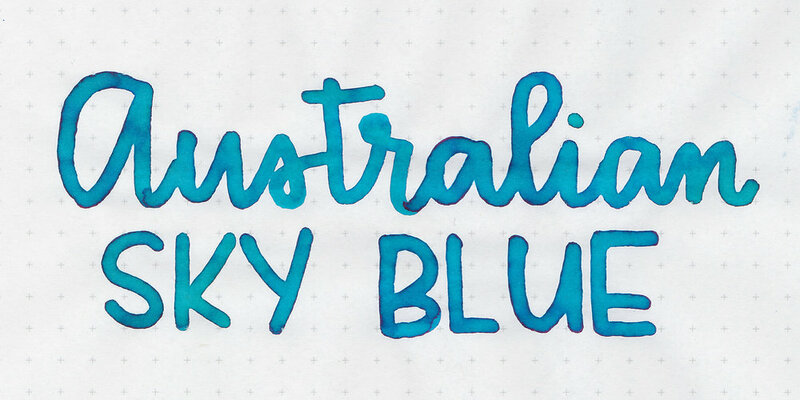 Australian Sky Blue is a bright blue/turquoise with some shading. I think it would work well for spring or summer, or even late winter. The ink drops show off the pretty pink sheen. It really reminds me of Lamy Pacific Blue, so we will compare them later on. Other properties: Medium shading, low pink sheen, and no shimmer. Ink swabs for comparison, left to right (top to bottom for mobile RSS): Robert Oster Blue Lagoon, Robert Oster Australian Sky Blue, and Robert Oster Bondi Blue. Click here to see the Robert Oster inks together. Australian Sky Blue seems the lightest, but it's very close to Blue Lagoon. Montblanc Unicef, Lamy Pacific Blue, and Robert Oster Blue Water Ice. Click here to see the blue inks together. This pen/ink/paper combination was really enjoyable for me, and I didn't have any flow issues. Overall, it's a pretty color and it has some nice shading and sheen. However, there are a lot of inks similar to this color now. Give it a try, you might love it.